If a player misses hitting his/her opponents conker they are allowed 2 more goes. If the strings get all tangled, the first player to call "strings" gets another go. If a player hits his/her opponents conker in such a way that it completes a whole circle after being hit (this is called ‘around the world’ that player gets another go. Another game sadly now banned in most schools in the UK. I then covered the bottom half in green Gingham vellum rounded off the corners and inked around the whole card first with Chestnut Brown and then Black ink pads. I then applied a piece of ribbon (a Chestnut Brown colour - but Black or Dark Green looked good too) to cover the vellum edge. After cutting out the picture I run a Black felt tip pen around it's edge to hide any White still showing. I mounted the picture using foam pads, printed off "Remember when" on my computer, mounted it on black card and used foam pads to attached this too. DOWNLOAD "PLAYING CONKERS" PDF FILE HERE. I used to love playing Marbles as a kid, I was quite a dab hand at it too and had a HUGE bag of marbles that had all sorts of silly names. You "had to" use the "lingo" while playing and use equal or slightly better quality Marbles to the ones you were trying to win. This is my little homage 5"X7" card to all men of a certain age that remember playing this game as a kid. The card was covered in my Marble paper (Included on the download) and covered with a strip of Sage green card that had been run through a "ribber" and backed with black card. I then used a template to cut out the words, aged them with a brown ink pad and backed them with black card. 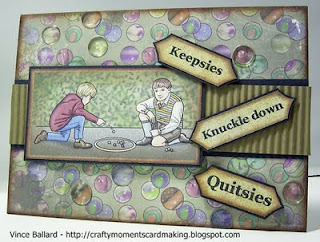 After backing the picture and foam padding it to left of the card , I then added the words and dotted some clear round gel stickers to some of the marbles to give it a bit of interest. I have a few ideas for more of these type of cards which I'll try to get done in the near future. CLICK HERE to download "Marble Players" PDF file. This card I did a while ago using a random butterfly stamp and a "House Mouse" Halloween stamp all mounted on foam pads. it's a pretty basic layout but I do like simple cards. I tried to keep it all the same hue. It was made it as an inspirational card for our little Niece. I've been experimenting with Fab's new "Personal impressions" stamps. I printed off my "Fairly Fairy Monster" onto white card and cut corners with corner punch, stuck it to silver Mirror card and cut the corners again. The card itself was covered with pastel squared K&Co paper, I then tied a loose knot in a length of matching pink ribbon adding a small piece of yellow ribbon into the knot before tightening it. I glued the ribbon on. stamped and die cut the message, using Fab's fantastic "Stamping up" punches. Then die cut stars of all sizes in pink and yellow dotting them out all over he card. Would make a good card for any little fairy princess that can be a bit of a monster sometimes ! A quick and effective way to use up all those spare bits of paper you have left that are too precious to throw away also a great plain card for a man. I think the bright colours on the plain black background are very eye catching. I was BORED ! so sketched and coloured a few of these little monsters thinking they might make a cute card. Can't wait till Fab's new corner Chomper comes, our one never cuts corners properly. I've added PDF files of the coloured and uncoloured monster in case anyone wants to print and use him/her. I'll upload some more of the little monsters later. INSIDE CARD SAYS - "But at least I'm faithful"
I think the butterfly card was made by "Kanban"(?) the footprints ("House-Mouse") were stamped on white card and backed with green. The butterflies were stamped and coloured with water colours and mounted with foam pads as was the "House Mouse" Halloween stamp. As the antennae on the butterflies were so fiddly I just drew them in afterwards with a fine tipped black pen. As Owl's are the bird du jour I thought I'd have a go at an Owl card, this was the result. This was my first attempt at braying (behind the owl) and I didn't have a scolloped edged oval so I had to cut one from black card freehand which I think gives it a more "handmade" look. The Owl and branch stamp are from "The Angel Company" and although you can't see it from this picture are mounted on foam pads. The "Owl's it going?" stamp is also from "The Angel Company". It went a bit off center when I stamped it ... but hey, no-ones perfect! This is my first blog, I'll be posting cards and other stuff I made as I go along. Come back and check every so often, thanks for following this blog. I hope this will give you ideas for your own crafting. Hugs Vince ! The cards was made using Smarty Pants stamps and the fairies were handcut by myself from black cardstock. Edges were inked.